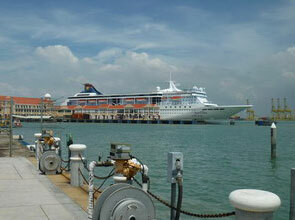 The State consists of the island of Penang (285 sq. km) and Province Wellesley (Seberang Perai) (759 sq. km). 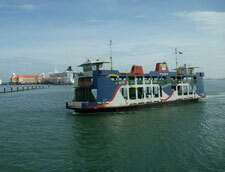 The two parts are linked by a regular ferry service and a 13.5 km Penang Bridge. Another bridge, 24 km long, linking Batu Maung on the island and Batu Kawan on the mainland, is under construction and is scheduled to complete by early September 2013. Penang State has a population of about 1.5 million with slightly less than half residing on the island. Penang island has transformed into a world leading multi-national electronic and export-oriented manufacturing centre since it ceased to be a free port status in 1969. It is also an international tourist destination with its rich historic sites, diverse culture, unique architectural buildings, lush nature and the beaches besides being a financial hub. Butterworth, on the mainland, is an important public transportation hub for trains, taxi, buses and ferry. There is also a daily international train that leaves the Butterworth railway station here for Bangkok with stopover in Hatyai, Thailand. One can also board the Singapore bound train from here. This ferry plies between the island and the mainland, a distance of about 3km with frequency of 10-20 minutes. The journey takes about 15-20 minutes. The first ferry departs at about 6.00 am and the last departs at about 1.00 am from both side of the terminal. The passenger deck is on the top level and the lower level is for vehicles. The Swettenham Pier on Penang island, which commenced operation in 1904 is another entry point of entry for tourists by sea. The Pier has since been renovated with modern facilities such as shopping lots, restaurant and transportation, to accommodate international passenger cruise vessels carrying more than 2,000 passengers. On the mainland the deep wharves, where the yellow container cranes can be seen, cater for international cargo containers. It can also handle an array of break bulk cargo such as palm oil in drums, refined sugar, bag rice, iron and steel products. Penang international airport, located on the island, have direct flight to Singapore, Bangkok, Hong Kong, Guangzhou and more. Penang Bridge is a dual carriageway toll bridge that connects Penang island and the mainland of Penang. It commenced operation in September 1985. The length of the bridge is 13.5 km making it the longest bridge in Malaysia and the fourth in Southeast Asia for the time being. Penang island was part of the ancient Buddhist-Hindu Kingdom of Kedah 1,400 years ago. Kedah became a Muslim Kingdom in the 12th century. Penang modern history began with the British occupying Penang island in 1786 and George Town was then established. George Town became an important trading port for the India-China trade. In 1800 a trip of land opposite Penang island was annexed and was named as Province Wellesley (now called Seberang Jaya). In 1826 Penang together with Malacca and Singapore, became Straits Settlements, which are administrated as a British crown colony. Malaya gained independence on 31 August 1957, which saw the end of the British colonial rule in all the states in Malaya, Penang included. In 1963 Sabah (North Borneo), Sawarak and Singapore join Malaya to form the Federation of Malaysia. Singapore left Malaysia in 1965. In 1910 Dr Sun Yat Sen （孙中山先生）made Penang as the Southeast Asia Tongmenghui （同盟会）heaquarters. He convened the Penang Conference to plan the Huanghuagang Uprising （黄花岗起义）with the objective of overthrowing the Qing Dynasty （大清皇朝）in China. That was an important Conference leading to the Chinese Revolution in 1911. The Revolution successfully brought down the Qing Dynasty, which ruled China for 268 years from 1644 to 1912. The Penang Sun Yat Sen Memorial Centre, located at 65 Macalister Road, includes a museum to preserve and commemorate the activities that Penang had contributed in the overthrow of Qing Dynasty in China in the 1900s. Penang Chinese Anti War Memorial During World War One, in the Battle of Penang on 28 October 1914, the German cruiser sank two Allied warships off the coast of Penang in the North Channel, northern part of the Straits of Malacca. During World War Two, Penang fell to the invading Japanese forces on 17 December 1941. On 15 August 1945 Japan surrendered. 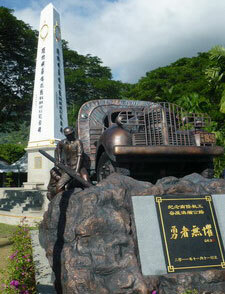 The Memorial (photo left), located at the junction of Penang Hill Railway Road and Air Itam Road was built to commemorate the Chinese who died for their resistance to the Japanese Imperial Army in Penang and the volunteered truck drivers and mechanics who had sacrificed their lives during the Sino Japanese War while in service at the trail of Yunnan-Burma Road (滇缅公路) (the present northern Myanmar and southern Yunnan Province, China) during the War. It was officially opened on 1.11.1951 at 11.00 am. Since then on 1 November at 11.00am each year a memorial ceremony was held at the Memorial site as a mark of respect to the deceased. Representatives from the Chinese based associations, groups and individuals, attended the memorial service. The Penang Museum in George Town houses documents and relics of the history and culture of Penang and its people. George Town, the capital of Penang, was declared UNESCO World Cultural Heritage City on 7 July 2008. There are rich collection of historic buildings such as the various Chinese clan associations, the various religious mosques, churches, Chinese temples, Indian temples, clan jetties, shop and residential houses. The various architectures bear testimony of the master and the multi ethnic settlers of those years influence significantly by the British who rule Penang for over a century and a half as well the confluence of the immigrants and the culture they brought with them. Core Zone (within blue colour line)：109.38 ha. 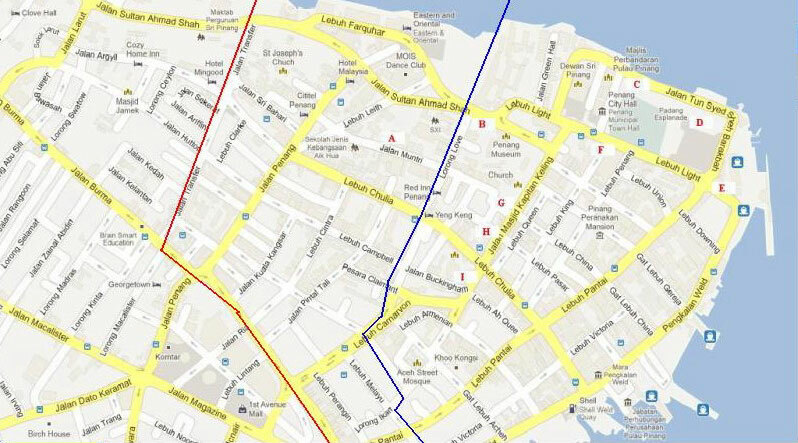 Buffer Zone (within red colour line): 150.04 ha. [A] The Hainan Temple (Tian Hou Gong) (天后宫) - a Chinese temple dedicated to Ma Zu (妈祖) and founded in 1866 by the Hainanese community. [B] Cathedral Of The Assumption (天主教堂) – a Catholic church founded in 1786 not long after Captain Francis Light landed in Penang. [C] War Memorial (一战纪念碑) – built in 1922 to commemorate those who perished in World War I (1914 – 1918). [D] Fort Cornwallis (保垒) – completed in 1810 for military purpose but historically was for administrative than defensive. [E] Clock Tower (维多利亚钟楼) - completed in 1902 to commemorate the 60th year of British’s Queen Victoria’s reign. [F] House of Yeap Chor Ee (叶祖意展厅) - Yeap arrived in Penang from Fujian, China in the 1890s and over years he built an empire of banking, real estates and commodity trading. [G] Goddess of Mercy Temple (观音亭) – a Chinese temple dedicated to Guan Yin and founded by early Chinese settles in the late 1700s. [H] Sri Mahamariamman Temple (印度庙) – an Indian temple, with a history since 1801, dedicated to the Hindu deity Sri Muthu Mariamman. [I] Kapitan Keling Mosque (回教堂) – built at the beginning of the 19th century and founded by the Indian Muslim community. The strategic location of Penang, at the confluence of the Indian Ocean and the Straits of Malacca, makes Penang an ideal port of call for ships plying between the East and the West. Penang is one of the most developed and economically important states in Malaysia. It has achieved remarkable success as a high-technology industrial park. Penang remains a banking hub with many branches of foreign banks, the latest being Bank of China besides other local banks. The population is highly diverse in culture, language, ethnicity and religion, which can be evidenced by the architectural structure. Bayan Lepas Free Industrial Zone is the biggest industrial zone in Penang with multi-international corporations producing high-tech electronics products for the export market. This outstanding achievement has earned Penang the nickname Silicon Island. The manufacturing sector contributes nearly 50% of the State’s GDP. The State was formally accorded the Multimedia Super Corridor City status. There are many modern structure and skyscrapers, commercial complexes and residential apartments in Penang. Komtar Tower, the tallest building in Penang with 65-storey and a height of 232 m, is located in the heart of George Town. It is a multipurpose complex consisting of commercial shop lots, transportation hub and administrative offices for the Penang State Government as well as the private sectors. Blessed with the multi racial, multi cultural and multi religious society, Penang obviously have a great number of festivals to celebrate and to observe. The Chinese celebrate: among others the Lunar New Year, Qingming, Dragon Boat, Hungry Ghost and Mid-Autumn. The Malays: Hari Raya Aidifitri, Hari Raya Haji. The Indian: Deepavali and Thaipusam. The Christian faith celebrate the Christmas and Good Friday whilst the Buddhists, the Wesak Day. Some of these festivals are also recognized as public holidays. George Town Festival is an annual event held within the Heritage site to celebrate the city’s World Heritage Site status. Another annual event, the Penang Festival, is held throughout the month of December at the permanent exposition site in Sungai Nibong, located next to the main express bus terminal, about 12 km from George Town. The Festival is a combination of trade expo, fun fair and cultural events.